Want to impress your husband or boyfriend on a special occasion? 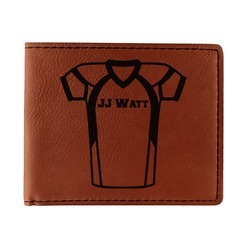 Get this dashing leatherette wallet personalized and that will do the trick! This bifold wallet is approximately 4.5" x 3.5" when closed. It has 6 slots to fit either credit cards, IDs, or business cards. There is a back flap for cash and two slots underneath the main card slots for extra storage. The leatherette material is smooth and flexible, as well as sturdy. It is a beautiful cognac shade of brown. Your bifold wallet will be personalized by laser engraving, which will be a black color on the wallet. 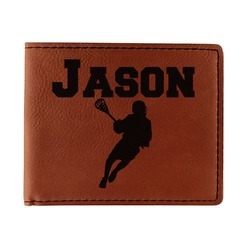 Choose a graphic, text, or monogram to personalize your wallet. There are thousands of choices in our design center. If you need help navigating the design center be sure to give us a holler. We are always ready to help. Looking for other wallets? Check out our wallets section where you will find our ladies wallet and check book covers.